Take the Network Concepts Survey! In this phase, we are asking some questions about two different bus network concepts. 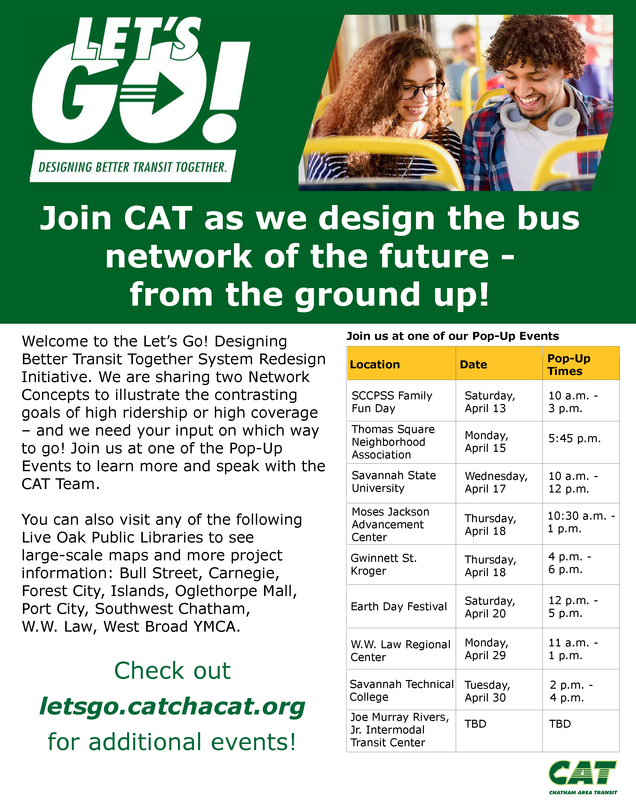 These concepts are intended to help CAT better understand what is most important for providing transit service for the community. Learn More about the Network Concepts. Network Concepts Webinar: Wednesday, April 17, 2019, Noon - 1 p.m.
2. Review the Network Concepts Report online (web or print). CAT will be out in the community sharing information about the network concepts. Click here for the latest schedule. FHWA has approved the Scoping Report. A complete copy of the report can be found here. 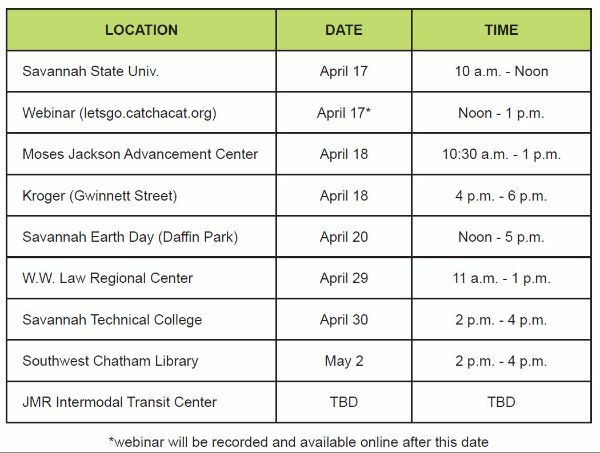 The Draft Environmental Impact Statement (DEIS) is progressing and in review with GDOT, and ultimately by FHWA. Agency and Public Scoping phases of the NEPA process have concluded. Mitigation planning for the project is underway. A Public Scoping meeting was held on February 13, 2018. Meeting materials and handouts are available for review below. After reviewing materials please use the link below to participate in the survey and submit comments. Comments will be accepted until March 15, 2018. The public is invited to attend and participate in this next milestone activity in the environmental process for Project DeRenne. There will be information at each station to encourage your participation and comments. Comments can be made at the meeting in written or verbal formats. Display information, handouts, and other documents will be posted to the project website for further study and review. On Wednesday October 25, 2017 the Agency Scoping meeting was held at the Georgia Department of Transportation (GDOT) office in Atlanta. This crucial, and required, step in the NEPA Environmental Impact Assessment (EIS) process invited local, state, and federal agencies to provide input to the project. In addition to representatives from GDOT and the Federal Highway Administration, 8 additional agencies and Native American tribes attended the meeting. These agencies were requested to provide written comments to FWHA within 30 days of the meeting. This input will be included in the design and NEPA analysis for the project. Our next upcoming milestone in the EIS process is holding a Public Scoping meeting. The meeting will be held early 2018. Stay tuned. Additional details will be available soon. Consultant started the preparation of a right-of-way and easement tracking spreadsheet to assist the City Real Property Department to develop a Right-of-Way cost estimate for the project. Consultant followed up with the Georgia Department of Transportation (GDOT) Office of Environmental Studies on the History Assessment of Effects review status on June 23, and submitted plan sheets for the project and description modifications, on June 28 for the Memorandum of Agreement between the Federal Highway Administration (FHWA), Georgia Department of Transportation, Georgia Department of Natural Resources Historic Preservation Division, and the City of Savannah. The Environmental sub-consultant submitted a revised Notification of Intent (NOI) to prepare an Environmental Impact Statement and 4(f) Evaluation; to the Georgia Department of Transportation on June 19, 2017. This document was then forwarded to the Federal Highway Administration on June 23, 2017 for their review and approval. Consultant prepared a Georgia Department of Transportation Preliminary Field Plan Review checklist with status updates for inclusion in the June 23, 2017 meeting notes. PLEASE SCHEDULE A PROJECT REVIEW SESSION! For more information, we encourage you to schedule an appointment to review the project in depth by calling Traffic Engineering at 912-651-6600.